Koffylaagte Game Lodge is an Eastern Cape safari lodge in the Karoo heartland that offers the warm hospitality and service of a bygone era. One of the first things that one notices is the pervasive sense of history about the Lodge. The farmhouse and its surrounds contain many relics from its colonial past, including the well preserved ox wagon situated outside the lodge. 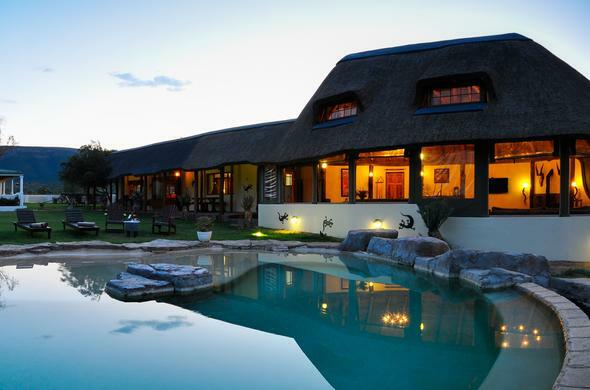 Koffylaagte Game Lodge is situated in a pristine Karoo nature reserve, and visitors may see White Rhino and up to 20 different species of antelope such as Kudu, Eland, Cape Buffalo, Giraffe and Zebra as well as many smaller animals such as Meerkat and Warthog. Guests on an Eastern Cape safari at Koffylaagte Game Lodge can find accommodation is a choice of Upmarket Lodge Rooms, Luxury Safari Tents, Settlers Farmhouse, and the eco-friendly Bush Cottage. There are accommodation types for different groups of travellers, and the modern facilities will satisfy all needs. Children of all ages are welcome, but children under the age of 6 yrs may not accompany their parents on game drives, unless parents have hired the vehicle exclusively.